Above: This Saturday is the annual campaign to show support for small businesses. Across the nation, people will support small businesses this Saturday, November 24th. Will you? Whether you’re shopping for gifts or buying your holiday decorations or preparing to entertain – consider shopping in town. Even if you aren’t celebrating a holiday, you finished your preparations early, or you can’t deal with Christmas shopping yet – you can still take part. Celebrate date night, splurge on a gourmet coffee, get your nails done, pick up a nice bottle of wine, or buy a new accessory just for you. There’s plenty of ways to show your support for small business. Looking for where to shop (or dine)? Some small Southborough-based businesses advertise on the blog. 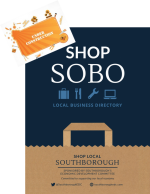 This week, the Economic Development Committee was working to update its “Shop SOBO” pfd, a directory of Southborough business. That should be up to date now. The directory makes it easy to look up Southborough based retailers, services, and much more. Click here to open it. Feel free to share in the comments news about any special sales in town tomorrow, or your favorite Southborough located/owned small business. I’ve just returned from Wolf Hill Farm in Southboro. I took my friend there to pick out a tree. They had a fabulous tree farm with all kinds of trees and various sizes. My friend tagged a tree so when she comes in a few weeks it will be waiting there for her. Then we went into the barn. Oodles of items just waiting to be scooped up. She bought placemats, rug mugs, and a wreath. I had trouble deciding on which microwave pouch to get for my cousin. I bought one earlier and use it for heating bread, baking potatoes, and it was a great way to cook corn on the cob. Of course, we had to buy their honey. So good from their own bees. Everyone was so helpful and friendly. My friend says she will never get a tree anywhere else. Farms have been a very important part of Southborough’s history, especially Deerfoot Farms. Why are farms not listed in this publication? We do have some still existing and there are people who are working very hard to make them successful. They have been ignored repeatedly. I am sure it was an oversight but, since it is an old document from before my time on the EDC I am going to confirm. We are working on an updated version and I will absolutely make sure local farms are included in the new document. I also heard back from the interim EDC Coordinator, Claire Reynolds, even though she’s on vacation. She told me that she was unable to get an update on the website – so the link was going to the old directory, not the new one. But it seems the new one still would have missed the farm. Deerfoot Farms isn’t listed on either. Based on your comment, she guessed that we might hear from others that want to be added to the list. She asked me to point anyone with questions/additions/deletions to creynolds@southboroughma.com. She’ll be back in the office tomorrow.